"Knowing cats, a lifetime of cats, what is left is a sediment of sorrow, quite different from that due to humans: compounded of pain for their helplessness, of guilt on behalf of us all" -- Doris Lessing, "Rufus the Survivor"
The admiral and I were away this past week -- in NYC and I've written a travel piece on our time there on Ellen&Jim Have A Blog, Two Three nights & days in Manhattan. While riding on a train or car or (once) bus from place to place, I read books, each time one shoved into my handbag for when I was walking. One of them had me laughing aloud and at times close to tears. It really moved more than many professedly seriously emotional or comic books have in a long time: Doris Lessing's On Cats. It might not attract much attention --- like her Martha Quest series, or the once stunning Golden Notebook -- or the profound Good Terrorist, or her memoirs, African stories, not to omit her journals and science fiction, not have much of a following. But On Cats is very good. 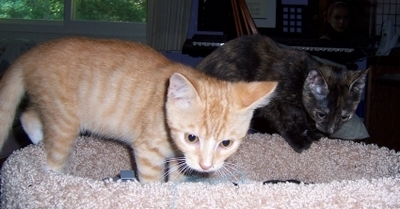 Here our two are when they were kittens, 4 years ago: the ginger tabby (marmalade, orange) cat is the boy, Ian who I wish we'd called Little Snuffy; the tortoiseshell with green eyes (not blue) is the girl, Clarissa, who should have been called Marianne because of her passion for dead leaves. Lessing made me remember continually how much my two cats are alive personalities with feelings and thoughts as valid as my own -- they just can't specify them -- and how it's my responsibility not to take advantage of my power over them (except of course when it's a case of their nuzzling a wire, pawing at the computers, or when we must must take them to Vet). This friend killed the cat because it was expensive. The cat was bred to be expensive and then killed because of this. Could it be the person spited was Hancock himself? or Hastings? I've read again and again of people taking out their resentments on other people by killing a cherished cat or dog. Conan Doyle has a cruel Sherlock Holmes story where a tyrannical jealous husband destroys his wife's beloved dog. There is a very cruel 18th century poem by Thomas Gray where he is reveling in the death of a "favourite" cat. Is it all made up? Is he reveling in the death of this poor cat? glad it got more than its comeuppance in trying to catch a fish? or was it a favorite and he couldn't save it? And there's the :"light" misogyny too. 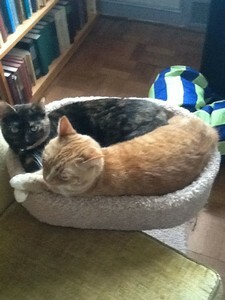 But see Johnson and Hodge: "Hodge is a very fine cat, a very fine cat indeed." Lessing frames her book this way in order to shock us, make us feel how disgusting it is to kill animals this way. She has some suggestive words alluding to the heaps of animals massacred this way. Lessing's mother is deeply distraught after one such killing but she does it. The father turns white. They also kill cats by mistake (!) and the mother weeps. We also see the cats kill small animals and birds swoop down and carry small cats away to eat them presumably. Had the book kept this up I could not have gone on, but this is only a few pages at the opening which now and again are alluded to when Lessing describes or refers to how she sees cats carelessly damaged and badly treated by their owners when she is an adult living in London. She implies that her love for cats began when she saw them so mistreated, that it was a reactive kind of emotional defiance. In this early section she tells of one beloved cat whom she slept with as a girl. As opposed to everything else I've read so far (including Temple Grandin's Animals in Translation) Lessing frankly takes into account the views of many people and their behavior first and the cat's place (so to speak) in the animal order. As the book moves on it becomes a marvel of a text. She begins to tell of individual cats she's known and owned. It's still for the strong stomached. Cats live tragic lives. When I told the Admiral this, he denied it, saying they lack a tragic flaw. I said well maybe they don't come up to Aristotleian tragedy, but it's tragic enough. What she does is enter into the presence of the cat the way she might a human being. She tries to keep this realistic by referring to herself now and again as watching the cat. 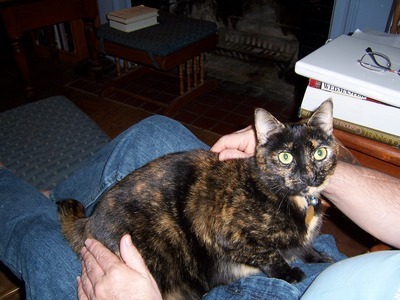 But watching the cat would not enable us to enter its feelings and implied thoughts the way she does. The vividness is a trick of style. The language is kept simple and concretely descriptive at all times. A long sequence is about two cats she had for years. Black cat and grey cat. So touching. They had names but she doesn't use them. She confesses that she changes her cat's names from time to time. Grey cat arrived in her home first, and so was the dominant cat. She tells of how she was led to neuter the poor creature and implies (rightly) in my view that we violate them when we do this, wrongly change their natures. We are driven to it to stop kittening. She does not mince words on how hard it is on the cat and shows the hypocrisy of people who insist how good it is for the cat. She would not be fooled by whatever is said on behalf of de-clawing them. She acknowledges their dislike of the cat basket once they associate it with going to the Vet and how the Vet does the less pleasant things (shots, pills, and yes operations) when we are out of the room. She did not neuter black cat so black cat repeatedly became a mother. It was a satisfying experience for black cat, and black cat took on many responsibilities teaching her kittens to eat, to use their litter box, and to tell danger from non-danger. At one point black cat came near death and did want to die when very sick. It's the story of how Lessing fought that cat to bring it back to feeling life and then wanting to live and how black cat in the process displaced grey cat's places in the flat and her bed and for a while was dominant over grey cat. 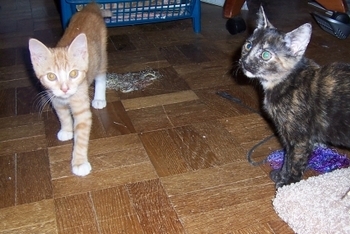 Interspersed are stories of wild cats, feral cats, abandoned cats. She tells of a mixed Siamese whom she describes with loving attention to her beauty and character. She made me rightly begin again to feel for animals who are locked out of the owner's house during the day or night. I was inuring myself to people doing this because it's easier than condemning a neighbor in my mind. But I know it's cruel. I hear them crying. One of my neighbors calls his cat "Alley Cat" as if that gives him license not to be a good friend-owner. And again and gain the dis-valuing of cats emerges. One story: a cat lived on the stairway of her building; no one would take her in. She miaowed and miaowed; sometimes people would offer her food; they would take her in briefly, but she wanted to go out again and they had not litter box. Then one day she was gone. The superintendent killed her because in a brief fit of illness she dirtied his stairs. It was bad enough he said having to clean after people. That cat was helpless against him. In all her stories, she makes clear how these creatures are cats, not babies, not people, lovable and loving friends who are cats. And how individual they are. The closing stories are the most moving of all "Rufus the Survivor" is about a cat who has a bad home. He is mistreated. He is shut out during the day; he is too thin; it's clear he is sometimes hit. He is cowed and has learnt to be a sycophant. It's a story of how slowly he insinuates himself into Lessing's home and gradually ever so gradually gets first her to allow him to stay, and then to stay for a while, and hen to live there. How he has to maneuver to get grey and black cat to accept him. How she takes him to the doctor for his ills and how he does not like it ever. Gradually he becomes braver and more confident and leaves the house to make friends. He even probably visits his ex-owner. She worries about this, but it seems the ex-owner does not try to keep Rufus. Rufus learns to show love and allow others to love him. El Magnifico is a hero's story. As the cat grows older, he gets cancer, and in order to have more years of life Lessing must amputate one of his legs. He cannot of course understand this. He assumes that she has utterly betrayed him not just in taking him to the Vet, but allowing this terrifically painful thing to be done. Ever after he has the worst troubles going to his litter box just outside the house (in a garden or yard), going up and down stairs, climbing things. But she cannot explain she is giving him more life. We see her interact with the cats and how the two species influence one another. This is very like what is found in Jane Goodall's studies as well as Montgomery's Walking with Apes on Goodall, Fossey, and Gildikas. When he was a young cat I would wake to find him awake and then, seeing that I was, he would walk up the bed, lie down on my shoulder, put his paws around my neck, lay his furry cheek against my cheek, and give that deep sigh of content you hear from a young child when he is at last lifted up into loving arms. And I heard myself sigh in response. Then he purred and purred, until he was asleep in my arms. He likes to be brushed slowly all over, and carefully, for the fur on the side where his front paw used to be gets rough and knotted. He likes to be kneaded and massaged, and to have his spine rubbed down, neck to tail, with my hand held hard. I wash his ears for him, and his eyes, for one paw does not do as good a job as two. And he licks my hand, which for a moment or two does become a paw, so that I can rub it over the eye on the side he can't reach, again and again, for his spit, like ours, is healing and keeps the eye healthy. Sometimes, if he has lain too long on the sofa he can get down off it only with difficulty because he has stiffened up, the way I do, from sitting still, and then he does not even hobble, but crawls painfully, letting out a frustrated miaow, to his other place, where the radiator heat will loosen his old bones. He is not doing badly, this old cat, with his three legs, and people coming into the room stop and exclaim, What a magnificent cat! - but when he gets up and hobbles away they are silent, particularly if they have seen him as a young cat step proudly out of a room, or lying on top of the basket - where he can no longer jump up - his two paws crossed negligently in front of him, his tail flowing down, his calm, deep eyes. When you sit close to a cat you know well, and put your hand on him, trying to adjust to the rhythms of his life, so different from yours, sometimes he will lift his head and greet you with a soft sound different from all his other sounds, acknowledging that he knows you are trying to enter his existence. He looks at you with those eyes of his that continually adjust to changes in light, you look at him, your hand resting lightly ... If a cat has nightmares then he must also dream as pleasantly and interestingly as we do. Perhaps his dreams could take him to places I know in dreams, but I have never met him there. essence of cat, finding the best of him. Human and cat, we try to transcend what separates us. graces the pages of P&P despite the fact that a pair of feline green eyes might have made an interesting counterpoint for Caroline Bingley. I say "one single cat" because a pair of cats do manage to creep into s&s. But they are a highly metaphorical pair of cats that have no more fur than a part of speech, being simply a word that Mrs. Jennings uses to describe how she and the colonel will "sit and gape at each other as dull as two cats". Not a phrase to impress Doris Lessing, I fear. Austen avoids cats. Austen avoids cats, America and royalty. Are you SURE Doris Lessing isn't slightly sentimental about cats? I find it highly improbable that one could anthropomorphise one's way through a number of feline lives without stooping to a touch of sentimentality here and there. I hasten to add I have not read the book. I must also add that here in Australia there is a huge anti-cat culture. Domestic cats here can kill up to 40 small native marsupials and birds per week and feral colonies living on the edge of the bush (= wild countryside) can damage the native ecology substantially." Yes James Austen, Jane's older brother wrote a poem on a cat who ate part of a meal intended for him. He was a humane sensitive man whose nature was stunted by his wife. Jane Austen does remark on a small kitten she sees running up and down the stairs in their lodging house in Bath. "And whooooo recommended it to you! Me and Ron Dunning. Glad to hear you had such a good New York visit, we're having an exciting Alaska trip. And cats do live tragic lives." Diana B.
Ellen, Probably you have seen Blake's amazing illustrations to Gray's "Ode" on Selima; if not you might have a look at Irene Tayler's volume or the exquisite Trianon Press volume edited by Geoffrey Keynes. Both include Blake's illustrations for a number of Gray's poems. I believe they may also be available at the Blake Archive. Far outside C18, but you might also seek a copy of the collection of essays by H.P. Lovecraft called Something About Cats; I suspect you would enjoy the essay that gives the collection its title. Any recommendations for Irene Tayler's scholarship are always good ones, by the way. The Answer to the Lyre, (which seems to be buried somewhere in my study, so I can't check my accuracy right off). Thanks to Jim for the link to the Blake Archive. I've wondered about attitudes towards animals in the 18th century and know these were changing to valuing animals as living creatures with feelings and thoughts. There was a review of a book on attitudes towards animals, specifically apes in an ECS not that long ago. The best cogent or clear information on how apes were regarded in the 18th century I've read is in Jane Goodall's magisterial book on chimps (a full study after 45 years). What is simply around us a lot (and cats are ubiquitous in the US, the UK and other places I"ve lived) we don't write histories of; yet I'd like to know more about the domestic cat and how it was treated. Blake's illustrations of the poem very much humanizes these cats. They regularly look more like people dressed like cats than cats -- perhaps anticipating Broadway by about 150 years -- and in at least one image we have a very human-looking cat dressed like a woman who is looking upon her reflection in the lake. Her reflection is of a human woman. One is tempted to ask if Blake thought all women were cats deep inside or if all cats were women deep inside. It's very hard to see these illustrations without laughing a bit, and it doesn't help at all that the fish are often rather human looking too, but perhaps we can forgive him as to my knowledge Blake was no more a cat or pet owner than Gray (not that I recall -- I'm waiting for a rebuttal from Blake Records now). Of course Blake did believe that every thing that lived was holy, and asked us to consider the possibility that every sparrow that cuts the airy way is an immense world of delight. Even fleas had intelligences of sorts. Rather nasty looking ones too. My first reaction would be to say that Blake believed he was working out his visionary perception of the work of the Poetic Genius in the world, but the context of changing attitudes towards animals at the time could undoubtedly play an interesting role in Blake's thought too. Thank you again, Jim R, and Tom, there is also Cowper's "The Retired Cat:"
Survey'd the scene and took possession. How smooth these 'kerchiefs and how sweet! And to himself he said---"What's that?" One thing I notice about these illustrations as a whole group: how thin the cats are and mangy-looking. We are looking at cats who are all outdoor cats (as I put it, I'm not sure what is the nomenclature for the different behaviors of a cat). They have to fight for their own food, and they don't look nicely brushed or particularly sleek or comfortable; the hair stands up prickly-like. I don't have any big drawings to hand, but Victorian cats are far chubbier sleeker, the profile or outline looking very much like a cat in a US household today. As we continue to interact with cats, and force on them neutering and our ways of life, we do change the subtle directions of its evolution. Self-advertisement: for a discussion c18 attitudes toward cats, see my article “Oysters for Hodge, or Ordering Society, Writing Biography, and Feeding the Cat,” Journal of Eighteenth-Century Studies 33:4 (2010): 631-645. Thanks for reminding me. A very fine cat indeed. > Hodge on his lap while he pets him. I suppose you know Percival Stockdale's Elegy on Hodge? For Hodge to wake the plaintive strain. His dress through life, his shroud in death. I didn't know it so thank you. Tomorrow I'll write on C18-l about the oyster story -- how Johnson went out and bought oysters for Hodge lest if he ask Frank and Frank resent it Frank should take out this resentment on the helpless cat. Dickens's Sam in Pickwick Papers points out that "oysters and poverty" go together so perhaps the oysters were also cheap.